September is ending, all of us are looking forward to the fall bite. 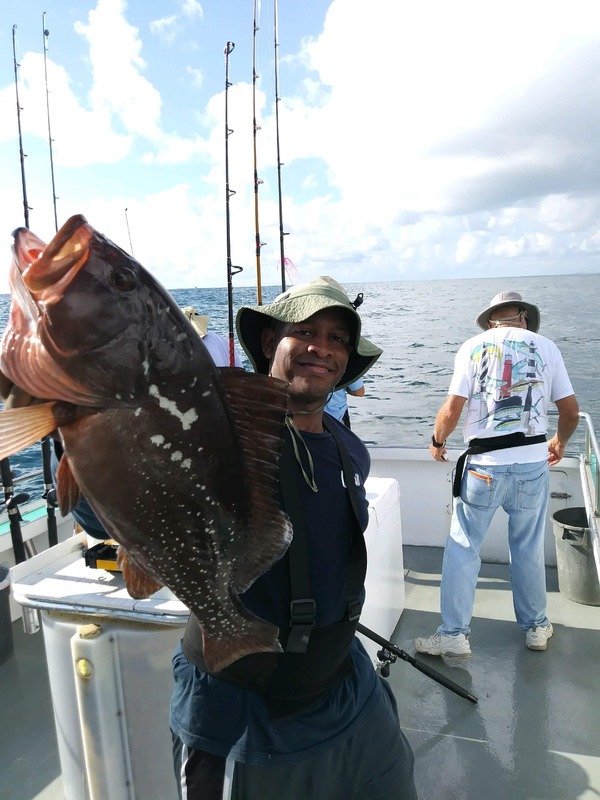 After “Irma” however, the bite turned on for a particular species of grouper. Knowing that, off West Palm Beach surely isn’t known for it’s grouper fishing and or grouper population, you couldn’t tell that after this storm. Grouper have been biting the bottom of the boats off. In a years time I would say it is safe to say that the boats here, on average get, maybe half dozen keeper groupers a year (give or take). After Irma, in one week we brought 21 keeper red grouper to the table, and I know the other boats have been good as well. So, as far as a fishing report goes, I would say that the “Bottom” fishing is great here of Palm Beach. Not only is the grouper fishing “OFF THE CHAIN” the yellowtail snapper bite is better than usual (or I should say, “the way it should be”). The yellowtails we are encountering are all above average with our record last week at 23 1/2″ long and the others not to far behind that!! The Mutton snapper bite was pretty good as well, quite a few last week over the 18″ minimum length and a bunch of shorts under the 18″ minimum. (I say it like that because I know there are boats out there taking advantage of the regulation, and putting a hurting on the 16″ fish by not entirely obeying the regulations, that’s another topic). There is a kingfish bite as well. So all in all the bottom fishing is again “OFF THE CHAIN” here off Palm Beach and West Palm Beach. The “blue water” bite is pretty good as well, with dolphin in steady numbers more so than the other species. Some Blackfin tuna and skipjack tuna around as well, I’m looking forward to the fall tuna bite that should be in full swing here coming up in October. We are seeing some sailfish off the edge and also on the reefs, looking forward for our first cold snap to really get them chewin’!! There has been a few wahoo around as well, all in all it is nice to see Palm Beach as a whole with a great bite all around. Whether your after bottom and reef dwellers or the pelagic species, right now Palm Beach County has a saltwater fishery for you!! It’s been a while since I have written one of these. Between poor fishing & a hurricane which I left town to avoid, there’s been nothing to write about. Irma did improve the fishing, however. I am not exactly sure why, perhaps by rearranging the bottom with an extended period of double-digit waves. The Mad Son has not seen so many legal size red grouper come over the rail, not in years, but ever. It started last Sunday, when they had a full day charter, half trolling, half bottom fishing. The troll accounted for 3 mahi & 2 blackfin tunas. The reef fishing, however, did better. Ten keeper red groupers, 4 yellowtail snappers, a mutton snapper, a rainbow runner, and a couple of porgies. They continued to have at least some success during the week. Now, on to Friday’s trip. I was joined on this much anticipated adventure by Dale, Simon, Bob & Harvey, regulars all. Captain George took us out to about a hundred forty feet for our first drift. We moved several times, occasionally to re-fish a good spot after drifting away from it, other times to find a more productive area. The depths varied, but nearly all seemed to produce something. Dale started things off with a respectable yellowtail snapper. I don’t think he put another keeper in the box until the end of the trip, but it was worth the wait, and there were a lot of non-keepers in between. We all caught throw-back mutton snappers & red groupers, most of them within an inch of being legal, making them fun fish to battle. Simon was, by far, hot hook of the morning. Seems like every time I glanced his way, his rod was bent. Even though a few of those were the reef, he caught a lot of fish. At the end of the trip, Dale caught a very nice red grouper, the largest of the trip, the only one that did not need measurement to verify its keeper status. At one point in the trip, Bob noticed a small school of ballyhoo in the chum slick off the stern. As I was watching those, I noticed a 9 inch long shrimp swimming on the surface. Biggest darn shrimp any of us have ever seen in saltwater. Our final tally was 3 red groupers (19, 20, & 21 for the week), 11 yellowtails, one of Harvey’s being over 20 inches, 3 mutton snappers, and a rainbow runner. There were more fish than that caught & released. I did not score one of the groupers, they were caught by Simon, Dale & Harvey, but I did manage a mutton, 3 ‘tails & a rainbow runner. You can’t ask for nor expect a better fishing trip than that. Thanks to Captains George & Rohman for a truly memorable fishing trip. Thanks for taking time, “Tight Lines” Capt. George, Mad Son Fishing..